Upon this rock, I will build my church and the gates of hell will not prevail against it. 20 centuries later, Christ’s church has crossed the globe. Yet, in its visible form, we often define it by buildings or large gatherings of people. So how big does a church need to be in order to be effective? If we believe the church growth movement, then mega-churches of 2-3 thousand members are the ones driving the Kingdom of God. But is this true? Last month, David Murrow mused that within 50 years denominations would be replaced by 200 celebrity pastors. Small local churches would be consumed by satellite campuses of mega-churches. Rather than people identifying themselves as Baptist, Presbyterian or Anglican, they will identify themselves as Driscollites, Hylesites, or Warrenites. Personally, I hope this is not true, as it would foster a host of problems – not the least of which is the idolatry of man worship. I find it hard to see how mega-church ‘pastors’ can even retain the title of pastor, when they maintain personal relationships with paid staff rather than members of their congregation. That is not to say they don’t have a valid role. It is just that they are in reality CEOs of organisations that direct functional program managers and cell group leaders. The cell group leaders are probably the ones who should hold the title of pastor. From a ‘risk management’ standpoint, Mr Murrow’s vision is concerning. 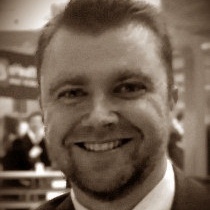 Why centralise all the ‘church’s leadership’ in the status of a few mega church pastors? Leaders, like us all, inevitably fall. While I understand that Jesus, builds his church, when we define the church by a mega pastor rather than Jesus, we set it up for failure. In their book, the Spider and the Starfish, the Power of Leaderless Organisations, Ori Brafman and Rod Beckstrom surmise that if you want to kill a spider, you step of its head and the whole creature dies. If you want to kill a starfish … well it can much more organically reproduce. In Acts 8, the church was being persecuted and one of its heads (leaders), Stephen, was killed. This caused God’s people (the church) to scatter through-out the known world. However, it was through this scattering and decentralisation, that the church grew. I personally believe the future would be better served with more local churches and less centralised leadership. The key ingredient that has helped the mega-church movement rise is the ‘Church Service’. While the NT does refer to the saints gathering on a Sunday, nowhere does it call that gathering a ‘service’. I service my car, I don’t service people. The idea that we can package our faith and worship into 75 minutes of slick choreography once per week seems cheap. Yet, contemporary Christianity does this with such regularly, that it has become how we think of church. I believe the rise of the church service is directly related to the declining commitment and a large part of why people don’t take church seriously. If a church is trying to compete with a rock concert, the rock concert will win every time. Instead, our church gatherings must be based on substance, not style. 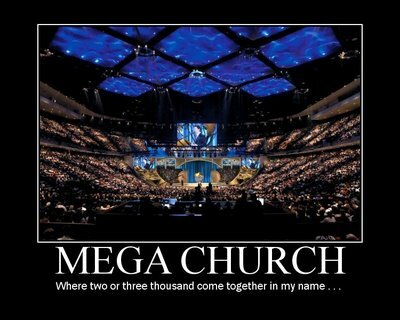 Despite my generally hesitant views of mega-churches, I don’t believe they are an illegitimate form of church. Mega-churches can be effective in certain contexts and with certain people groups. They however are not a one-size fits all model, and they certainly must not deride and belittle smaller forms of church gatherings. I believe smaller churches are more naturally build for pastoral dynamics. Everyone of us was made for relationship with God and for relationship with God’s people. Deep and meaningful relationships are not developed through facebook anymore than they are through a mega-gathering. Real relationship and real church occurs when God’s people personally know each other and are known. In mega-churches, this might occur in cell groups. But the logical question then is, if real church is occurring in the cell group, does that not make the 75 minute weekly presentation superfluous? Should we be calling the cell group the real church and weekly church service the optional extra? 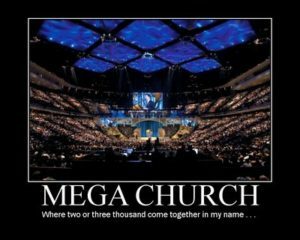 The future of the mega-church. Despite Mr Murrow’s thoughts, there are other who are forecasting the decline of the mega-church. Lillian Kwon ‘s research suggests that the mega-church come and see movement is fizzling. Just as the rise of Wal-mart and Westfield threatened the small corner store, so the rise of internet shopping will threaten the mega-store. Similarly, there is the real possibility that church consumers will soon tire of the ‘boxed packaging’ and seek meaning and substance in being known by others. Mega-churches would do well to note this and elevate cell-groups to primacy over the ‘church service’. Church gets real when we learn about Jesus and put that learning into action. At the end of the day, all those buildings and church structures will be burned up. What we have sown into the lives of people through Jesus name will last for eternity. Discipleship and mentoring cannot be mass produced. There is no way to manufacture or mass-produce evangelism. The Holy Spirit works through people not programs. Structures are helpful only in as much as they facilitate one to one people ministry. As we move the mega-church structure to the background, let’s pray that we will see more true discipleship. As we try to make the mega-church structure more invisible, let pray that we will see God’s church as both 2-3 people as well as 2-3 thousand people. Jeremy, you’re at a station of life in which relationship issues are of higher value to you than, say, agreement in doctrine and the need to keep watch over the faith by contending for it (Jude 3). To be closed to a possible correction of our thinking is just as myopic as to be closed to a correction in our relationships. But you saw a place for larger churches in this post, and I think that the place you saw was possibly for just something like that. There is a place for a few-to-many structure, in just this area — teaching (1 Cor 14:29)! And, I think we see there too, that it is not one-to-many, which can be abused, as you pointed out in the names of the new denominations by spoof, and it is not uncritical. We do not do well to uncritically accept our teachers, we do them a disservice. We need to “pass judgment” on them, as the verse says! In other words, see if they’re right! Larry, I am not sure I understand what you are trying to say. 1. I do believe doctrine is important. The focus of this post is the mega-church format, not a set of doctrinal beliefs. 2. Yes, there is a place for larger churches, but they should not be at the expense of relationships or be created by cannibalising small congregations. 1. Should we view ‘Pastorship’ as a role/responsibility or a position with a title? 2. As you’ve pointed out, cell leaders often assume pastoral responsibility without having a ‘title’ of Pastor. Is it accurate to say that today’s notion of a Pastor is a position of authority rather than a person who comes alongside another in the form of a bondslave, to lead one in the right and narrow way? or as you suggest, is the Pastor just a glorified CEO who knows not his sheep? I fear many of us are guilty of worshiping a Pastor in place of the One True Pastor. I do believe that now-a-days “Pastor” has become more title than role, but I think that it wrong and I think if Jesus walked amongst us as a human again, he would say similar words to us as he said to the Pharasees in Matt 23 (vs 7-10). The role of pastor is the role of a shepherd. In Acts 20:28-28, the leaders are told to keep watch over themselves and all the flock that they have been made overseers of. I definately think God meant more than just “look at them from the pulpit each Sunday”. If someone who has been put in charge of a church does all the preaching and leaves others to deal with the flock, then maybe they need to admit that their role in the body is preaching and not pastoring. Elizabeth, I agree with your sentiments. To answer your questions. I believe the title should match the function that is performed. It should not be reserved as a senior status symbol. If you provide pastoral care, then you are a pastor. If you provide oversight of a significant group of people (e.g a mega-church), then you are a ‘bishop’. If you spend most of your time being a Sunday or conference figure-head for a movement/message, then you are probably an evangelist. Those are all biblical terms. This is evidence of insecure leadership and empire building. Leaders who assign pastoral responsibility without authority set others up for failure. The result is they will have trouble keeping quality staff and volunteers. You raise a good point comparing pastoring to shepherding. In John 10:14, Jesus says, “I am the good shepherd; I know my sheep and my sheep know me”. Once a church leader no longer knows the names of his church members, how can he be their shepherd? A shepherd needs to be close enough to his flock that he notices and takes personal action when 1 of the 100 goes missing.